Two professors from the McCormick School of Engineering and Applied Science, Jan D. Achenbach and Zdeněk P. Bažant, received prestigious honors from the American Society of Mechanical Engineers (ASME) in 2012. Their career achievements are highlighted in two new ASME videos. Achenbach, an expert in the propagation of sound waves in solids, was awarded the ASME’s highest honor, the 2012 ASME Medal. The medal, established in 1920, is awarded for eminently distinguished engineering achievement. He was cited “for his groundbreaking contributions to the theory and applications of waves and solids, particularly in the ultrasonic range, applied to acoustic microscopy, dynamic fracture, and laser-based ultrasonics,” as well as “pioneering ultrasonic methods for quantitative nondestructive evaluation and structural health monitoring,” the video states. Achenbach is Walter P. Murphy and Distinguished McCormick School Professor Emeritus of Civil and Environmental Engineering, Engineering Sciences and Applied Mathematics, and Mechanical Engineering. He is a member of the National Academy of Sciences, the National Academy of Engineering, and five other academies. 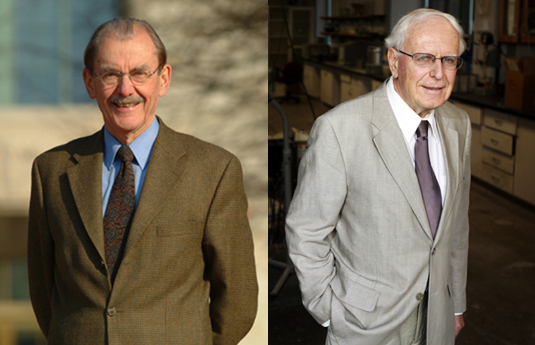 Bažant, an expert in solid mechanics and structures, was recognized with an ASME 2012 Honorary Membership. First awarded in 1880, the founding year of the Society, Honorary Memberships are bestowed upon people who have made “distinctive contributions” to engineering, science, industry, research, public service, or other pursuits allied with and beneficial to the engineering profession. Bažant was recognized for his contributions to engineering science, including his size effect law, which is widely used in determining safety factors for large structures made of concrete and other composite materials. His models for materials behavior helps engineers design ships, aircraft, bridges, highways and other structures, and he has conducted detailed analysis of the collapse of the World Trade Center towers in New York City. Bažant is McCormick Institute Professor, Walter P. Murphy Professor of Civil and Environmental Engineering, Mechanical Engineering, and Material Science and Engineering.